WHERE DID YOU ATTEND HIGH SCHOOL? HOW DOES EHS COMPARE TO THE HIGH SCHOOL YOU ATTENDED? I graduated from the Madeira School in McLean, Virginia. I loved spending my high school years in the D.C. area and wanted to offer my children a similar experience. Once Sutton chose Episcopal, the girls followed. I think Ali realized the great experience that Sutton was having and wanted to share in it. Camden, our youngest child, has seen all that Sutton and Ali have accomplished and experienced in their four years at EHS, and she is excited to follow in their footsteps. Mike attended Virginia Episcopal School in Lynchburg, Va., as a day student. Like Episcopal, VES has a strong honor code that forms the foundation of the school. A strong commitment to honor was a crucial component of the high school experience that Mike sought for our three children. Episcopal is in many ways the perfect combination of both of Mike’s and my own very positive high school experiences. 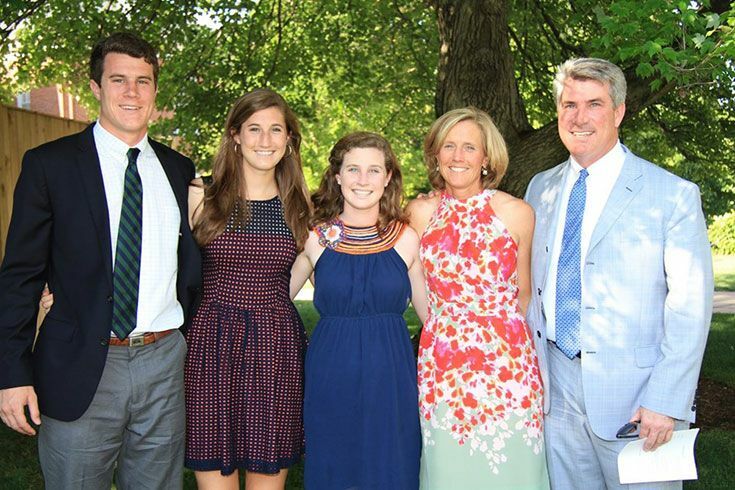 WHY DID YOU DECIDE TO CONSIDER A BOARDING SCHOOL FOR SUTTON ’11, ALI ’13, AND CAMDEN ’17? We encouraged Sutton ‘11, Ali ’13, and Camden ’17 to attend boarding school with the intent of exposing them to new ideas, people, and places. We felt the experience would broaden their horizons, push them academically, and stretch them personally. Mike and I wanted our children in a community that encouraged them to step out of their comfort zone, but at the same time one that was ready to catch them when they stumbled and to hold them accountable when they erred. We wanted them in a community that instills a lifelong love of learning, fosters compassion, and honors integrity. WHY DID YOU CHOOSE TO SEND THEM TO EHS? We took each child to visit several schools, but ultimately the decision was theirs to make. Each child felt that Episcopal was the right fit for them individually. While each of our children are very different, they have each been drawn to EHS because of the strong academics, the proximity to D.C., the opportunity to play competitive school sports, the 100 percent boarding community, the strong relationships between the faculty and the students, and the strong sense of community. HOW HAS EHS IMPACTED YOUR CHILDREN’S LIVES? Episcopal has molded Sutton and Ali into incredibly independent yet compassionate and caring individuals with a keen interest in learning. We feel so fortunate that our children have had such amazing mentors during their four years at EHS. Sutton will be forever impacted by his relationship with Gideon Pollach, Bobby Watts, Kevin Soja, and others. Ali would not be who she is today without the female leadership of Mary Hobart, Allison Holby, Meghann Jones, Stacie Williams, and other mentors like Joe Halm and Tim Rogers. These adults have reinforced values that, coming from a parent, sounds to a teenager like nagging. They have also introduced our children to interests about which Mike and I have little knowledge (like biology, physics, and Spanish.) They have ignited passions, inspired leadership, and molded our children in numerous ways for which we will be forever grateful. HOW DID THE DECISION TO SEND SUTTON AND ALI TO BOARDING SCHOOL AFFECT THEIR RELATIONSHIPS WITH YOU? Sending a child to boarding school is hard. There is no denying that you miss your children immensely, and it can be difficult to parent long-distance, but Mike and I believe it is an incredible gift to both our children and to us as parents. Boarding school tended to remove the daily minutia from our relationship with our children. We were no longer engaged in the daily nagging about making up beds and picking up clothes. In essence, we were freed from the daily grind to talk about more important subjects, like their experiences, goals, and relationships. While we may have sacrificed the quantity of time that we spent with our children during their four years of high school, we feel we replaced it with quality time. Our time together and our conversations became more meaningful and substantive.